Student teams from Topsail High School and Duplin Early College High School earned top honors in the inaugural Chancellor’s High School Innovation and Entrepreneurship Competition. First place winners received $1,500 in cash for the school they represent in order to enhance their school’s entrepreneurship offerings. Second place winners earned $1,000 for their school; third place winners, $500. The students themselves also received trophies and copies of The Lean Entrepreneur, the book by Brant Cooper and Patrick Vlaskovits that inspired the competition. The students’ final pitches were judged by UNCW faculty members: Stephen Harper, professor of management from the Cameron School of Business; Jess Boersma, assistant professor of Spanish and director of ETEAL; and Raymond Pastore, assistant professor of instructional technology from the Watson College of Education. 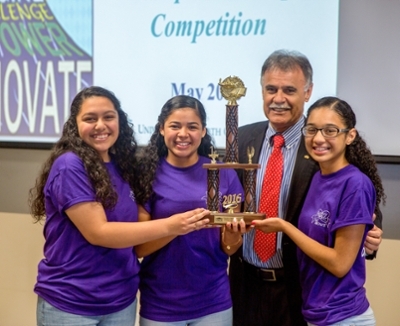 Students from 50 high schools across southeastern North Carolina were invited to register for the competition, founded by Chancellor Sartarelli in partnership with the CIE, to challenge students to create innovative solutions to real-world problems and enhance their knowledge of entrepreneurship. 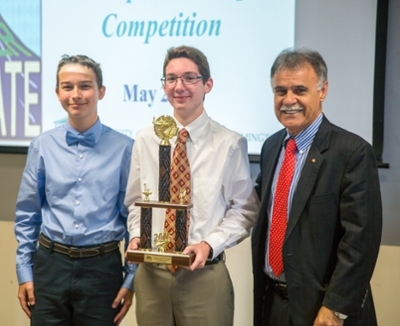 The high school teams’ initial presentations were due April 23, the semi-finalists were announced on May 2 and the finalists were announced on May 14.